If one looks only at the kilometres operated per vehicle, this does not tell the whole story. The streetcar fleet operates on slower routes than other modes, and even if vehicles are in service for the same number of hours, they accumulate less mileage. 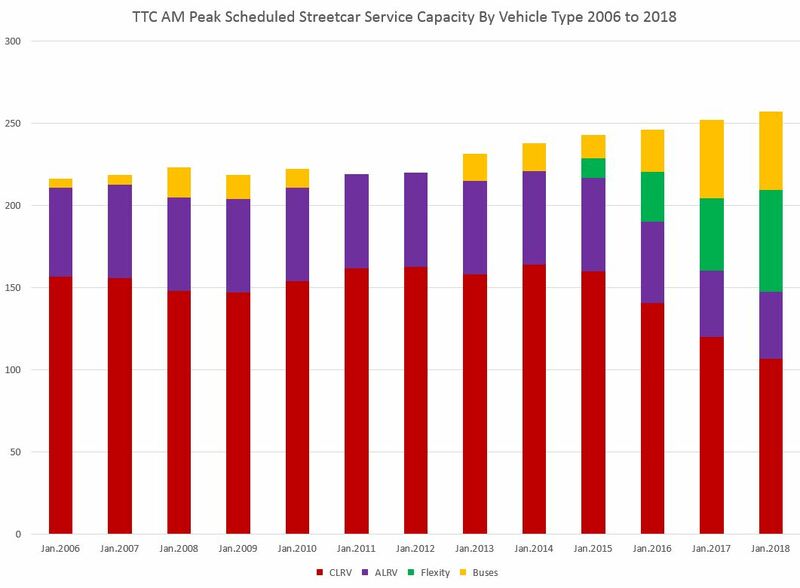 This is further complicated by the number of out of service streetcars that count as part of the active fleet and dilute the total mileage on a per vehicle basis. Bus mileage per vehicle is climbing because of utilization. With the growth in off peak service, more buses run longer hours and thereby accumulate more kilometres for the fleet. 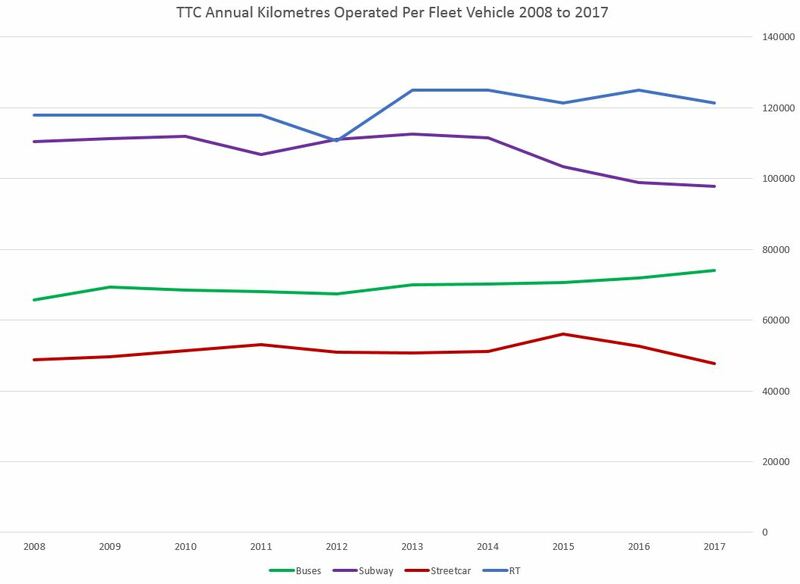 Subway mileage has fallen because the fleet is now larger than required to operate current service. There are more T-1 cars than needed to run Line 2 BD because some of this fleet was originally planned for use on the Vaughan extension and on Line 4 Sheppard. There are more TR cars than needed to run Line 1 YUS because some of the fleet needed to provide more frequent service after automatic train control implementation have already been acquired. If the fleet were sized to current requirements, it would be smaller, and the mileage per vehicle would be higher. RT mileage is strong because a small fleet which is going through a major overhaul causing a shortage of trains runs all day long on a route with widely-spaced stations. For modes with fleets of differently sized vehicles, one vehicle kilometer does not represent the same amount of service for each type. An example of how this can be misleading is that when the TTC replaced its 8-car Gloucester trains on Line 1 YUS with 6-car H trains, the subway mileage went down, but the service provided was the same or slightly improved. Raw fleet and mileage counts should not be used as direct measurements for service provided to riders. They measure fleet utilization and overall service characteristics, but not service quality or quantity. The early years of this chart are dominated by the St. Clair streetcar project. This began with bus substitution on the short section between Bathurst and Yonge, but then moved on to the west end of the line. In 2013-2014, Queens Quay was under construction with buses replacing streetcars for the duration. 2015 saw the beginning of bus trippers operating on streetcar routes with 20 buses assigned to 504 King. 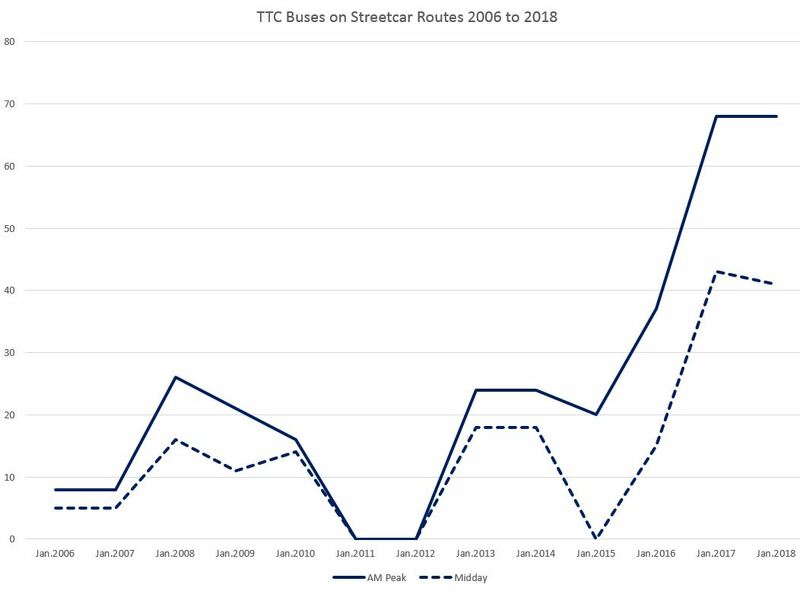 The number on King dropped off as more streetcars became available to operate that route, but bus substitutions on other major routes more than made up for the decline. There will be a slight drop in September 2018, but the bigger change awaits the arrival of more new streetcars. There is also a major construction project planned for 2019 that will affect the west ends of 501 Queen and 504 King, and so the need for buses on streetcar routes will not really disappear until late 2019. The linked set of charts and tables includes a detailed breakdown of where buses have been allocated over the years. 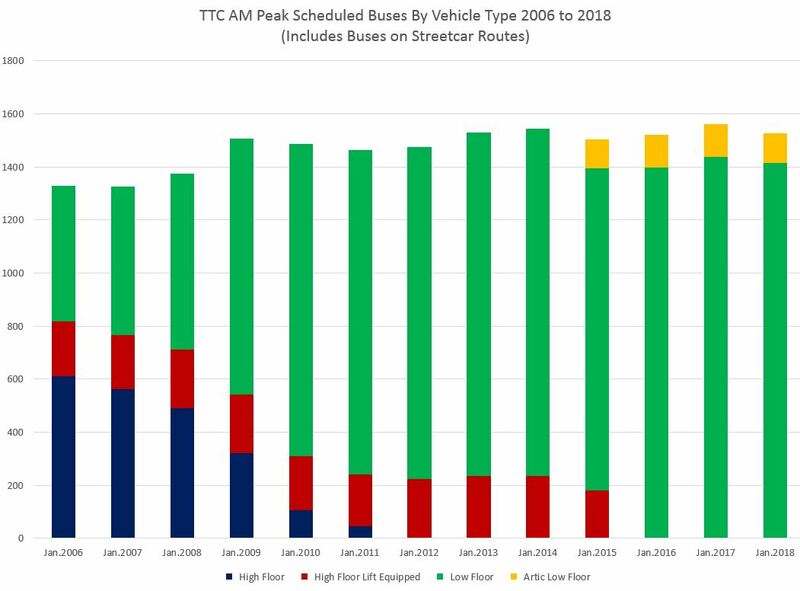 The chart below shows the evolution of the scheduled service from high floor to low floor vehicles and the arrival of articulated buses in the fleet. These are vehicle counts, not capacities, although with standard sized buses dominating the fleet, those numbers are close together. Also, this chart includes buses operating on streetcar routes. The chart below does not include the capacity of buses operating on streetcar routes. Each articulated bus above counts as 1.5 buses in the chart below. 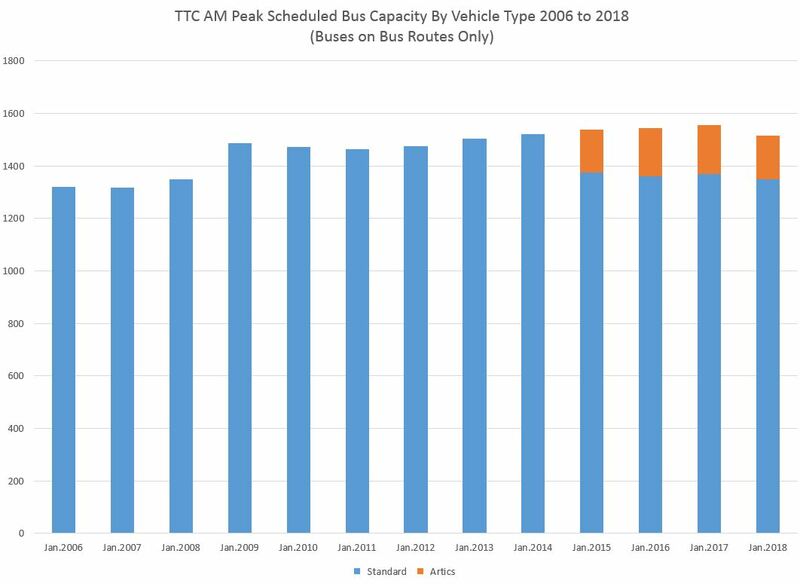 What is quite visible here is that the capacity of the peak service actually operated on bus routes (as opposed to any other change such as the size of the fleet) has not changed very much over the past decade. A few improvements are expected in fall 2018, but the details for all of them are not yet available. In any event, the biggest constraint on service is the lack of garage space. This will be partly relieved when McNicoll Garage opens in 2020, but current plans do not include any new garage after that until the mid 2020s. This will limit the growth of bus service for many years to come. Over the past decade, the number of scheduled streetcars has declined as old cars wear out and are retired. Recently, Flexitys are replacing old cars, but they are barely keeping up with the loss of vehicles. A further problem, as noted above, is that far fewer ALRVs are actually available for service than are scheduled. The result is that service operates with the smaller CLRVs, although at least the TTC has now built the 501 Queen schedule to take this into account. All the same, the replacement of 20 ALRVs by CLRVs represents the loss of 10 CLRV’s worth of capacity (20 ALRVs are equivalent to 30 CLRVs). This is not reflected in the charts because they deal with service as scheduled not as operated. 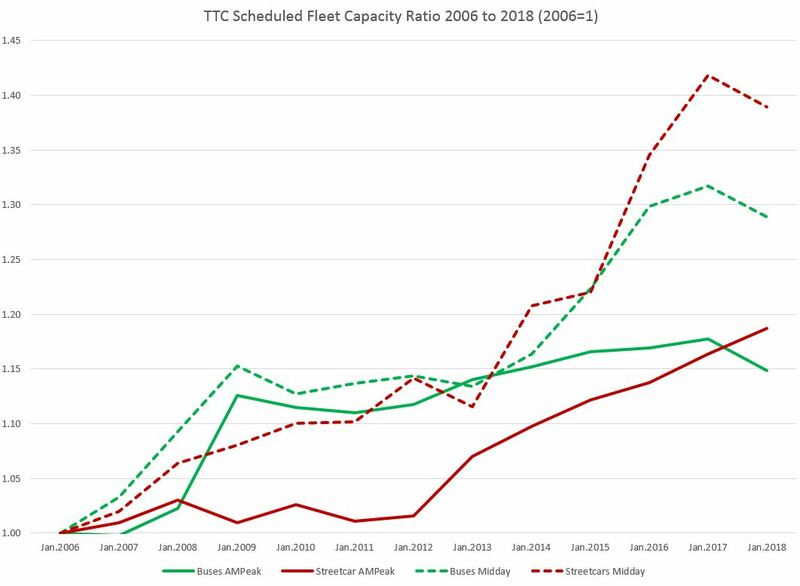 Conversely, the number of Flexitys in service is now growing beyond the scheduled level and this benefits routes, notably 504 King, which can receive more capacity than is actually planned. The reduction in streetcar numbers is offset in part by buses (yellow below), and by the contribution of the larger Flexitys (green) to the fleet. 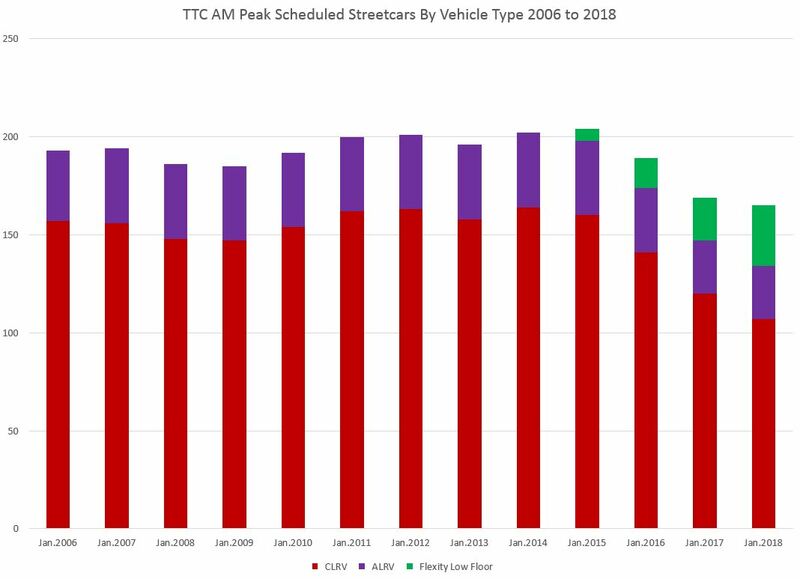 The total scheduled capacity of vehicles operating on streetcar routes is rising although this must be tempered by the fact that the ALRV numbers (purple) are greater than what is actually fielded by the TTC. November 2017 is the last month before the Vaughan subway extension opened. It shows a larger number of buses in service than January 2018 because of the net effect of service changes. The bus count is expected to rise again through fall 2018 with service improvements for which all details have not yet been announced. September 2018 will see a change in streetcars operating on bus routes compared to January 2018. The updated numbers are included for reference. There are two tables each spread over two pages. One is for the AM peak period, and the other for weekday midday service. This entry was posted in Buses, Service Cost and Quality, Streetcars, Transit. Bookmark the permalink. The wasted space in low-floor bus has bugged me for a long time. No one wants to stand in the raised section at the back of the bus because it’s cramped, there’s no way to get out, and those stairs seem to create a psychological barrier or something. I noticed that the Germans have a newer design for low-floor buses that seem to solve a lot of those problems. If you look at photos of the newest Citaro buses, they are low-floor from front-to-back (they just raise the seats at the back instead of raising the whole floor). Instead of the whole back of the bus being filled with equipment, only half of the back of the bus is filled with equipment. You get (half) a back window again! And they threw in a third set of doors in the back, so it can unload faster, and so you don’t get trapped if you move all the way to the back of the bus. I wonder if the TTC can get the manufacturers to incorporate some of those improvements in the next round of bus purchases. We still have politicians (who don’t use public transit) who insist that less is more. Save money by filling the buses with as much of the lower classes as possible, don’t get more buses. The TTC is still influenced by the old Ford mayoralty administration. Steve: There is also an ongoing practice of stretching headways to make longer running times rather than adding more buses. A long ongoing annoyance that will not go away is the fleet of “Sorry…” buses that roam our streets. These buses are ALWAYS empty! Why? The purpose of having buses on our streets is to provide a service, a ride. It is NOT to wear the rubber off the tires! Yet, today (2.15pm) I see THREE “Sorry route” buses pass (within a few minutes) about 8 riders waiting to make a transfer. WTF! 20 minutes later still no in-service bus! The practice of sending empty buses deadhead (empty) to the end of a route is a WASTE of money and pisses off people for no good reason. It is much like the 2 hour transfer that the TTC stubbornly refused to institute for DECADES! ALL buses should be IN SERVICE beginning at the FIRST stop after leaving the garage. PERIOD. Raymond wrote: ALL buses should be IN SERVICE beginning at the FIRST stop after leaving the garage. PERIOD. I have mixed feelings on this. There are numerous situations where the need is to get buses to a particular location to cover needed service, and that should preclude picking up waiting passengers along the way. However, there are times when this is not the case, but the issue becomes one of a bus serving a stop that is NOT going to the place or places where buses serving the stop are supposed to go. When a bus is going out of service and is returning to the garage, this is somewhat more feasible, though it does require passengers to know roughly where the garage is. For some people, this could mean they could get a one-seat ride to their destination where it may not ordinarily be. 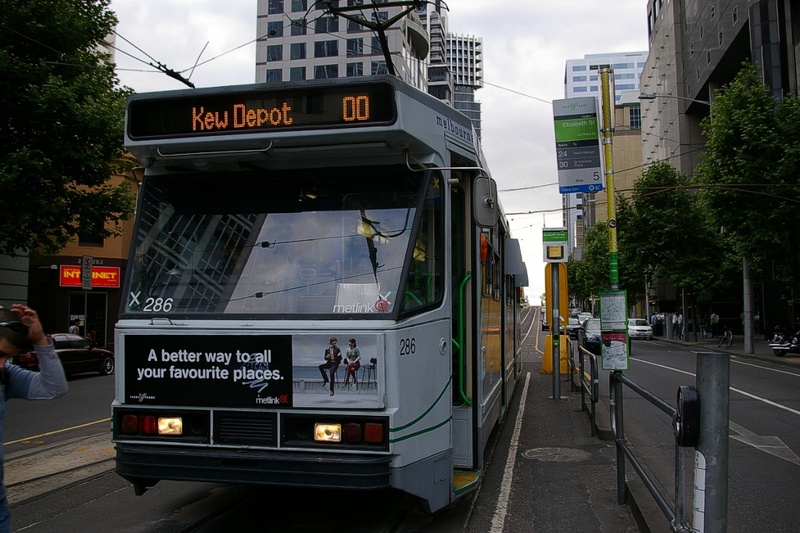 In Melbourne, trams ending service to return to a depot do so in service signed as route “00” with the depot as its destination. Buses in Pittsburgh going to a garage are signed with the name of the garage they are heading to, though I can’t say if they run in revenue service. I can’t think of why a bus needs to be signed with the garage name, unless there was a need for the public to know where it was going, such as flagging it to stop to pick them up, but I really cannot say.